Discover the secrets of the bustling, historic Rastro flea market before enjoying classic Madrid tapas like a local! Dive into the bustling backstreets of Madrid’s famous Rastro flea market, founded around 1740! Led by a passionate local expert, you’ll discover the secrets of this historic market and its overflowing antique and second-hand shops. We’ll take you past the market’s surface, where you’ll meet charismatic vendors and hear their stories of life in the Rastro! After the market, you’ll pop into two buzzing tapas bars to enjoy some of Madrid’s most classic tapas. Side by side with the locals, you’ll try grilled seafood, crispy pork belly and more! And of course, these delicious bites will be paired with local wine, beer and vermouth. This true Sunday morning Madrid experience is not to be missed! You'll meet your local guide in Plaza Tirso de Molina before heading deep down into the heart of the bustling Rastro Market. From there you'll pass through Plaza Cascorro, where the market was first started more than 500 years ago and the epicenter of the current market today. You'll start to make your way down the main drag of the market, stopping in some of the market's most iconic stores as you go. Visit the oldest leather shop in the market, a handmade ceramics store run by a father-son-uncle team, the best place in Spain to buy old, rare and unique antiques, and a vintage clothing store opened by a local actress, with you guide revealing the stories behind the stores and their owners as you make your way around the market. Then, it's time for tapas! 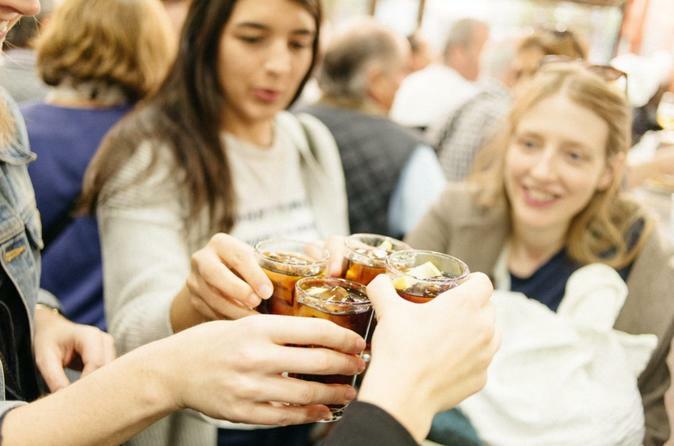 Sip on sweet artisan vermouth in the best no-frills seafood tapas joint by the market, before heading to a bar that has been a staple of the Rastro tapas scene for over 95 years! Indulge in local specialities such as snails (don't judge until you've tried them!) and Spanish potato omelette. By the end of the morning you'll have experienced the best of both sides of the famous Rastro Market-- the unique stores, and the delicious tapas!